The online platform creates a digital command center that makes it easy for administrators and teachers to coordinate activities, and for parents to grant permission and pay fees. 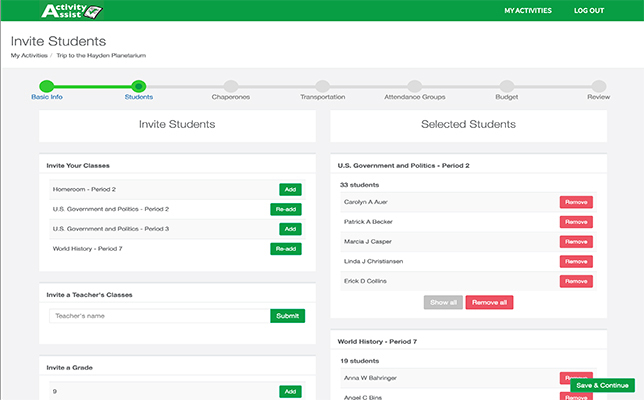 Paper permission slips and invitations for school functions may become a thing of the past, thanks to a new online platform that allows schools to manage school events in a secure online environment. Activity Assist is designed to help teachers and administrators coordinate field trips, school dances, club meetings, sports games and other school events. Through the easy-to-navigate Control Center, teachers can create events, track permission slips and payments and communicate with students and parents. All information is protected by Activity Assist’s partner Clever, which integrates SecureSync into the school’s students information system. Activity Assist's mobile app version features a “modern clipboard” interface. Teachers and chaperones can use the app on the day of the event to take attendance, and afterwards, the app will automatically send an attendance report to the school’s attendance office. The app can manage transportation as well, keeping track of students on separate buses or in cars. Additionally, the app enables teachers to identify students with special concerns, such as allergies, asthma or other health issues, and instantly access emergency contact information for each student. Activity Assist recently secured a $20,000 investment from Dorm Room Fund (DRF), a student-run venture fund backed by First Round that invests in student-run companies. “By digitizing how teachers plan field trips and execute the event, Activity Assist is saving schools time and money, as well as allowing teachers to focus on what they do best, teach,” according to DRF's announcement on Medium. Further information, including a video demonstration, is available on the Activity Assist site.